Top-notch translators always advocate clients choose native-tongue professionals with sector expertise. I’ve certainly promoted that mantra. In the past week, a personal story drove that home — like sharp dart landing smack in the bull’s eye. In striving to rescue a cat, I nearly put its future in peril. Only my (professional translator) discomfort with the slightest possibility of different interpretations made me dig further, nearly harassing officials over terminology and what it means in practice until I was sure. And thank goodness I was relentless. I was going to fly to the US commando-operation-style to rescue a cat and bring it back to France. A crazy plan like this would not surprise anyone who knows me. Logically, it is the country of import that sets the rules. All my ducks were lined up. The cat had the 15-digit international microchip and vaccines, I had the Annex IV EU paperwork, a USDA-accredited vet ready to give the cat its pre-departure check-up and fill out the paperwork. We were set. The cat would be saved. Is a USDA-accredited vet an official veterinarian for the powers that be in Europe? Why does the US tell me I need for a USDA-certified vet to fill out and stamps the health certificate AND to have that endorsed by the USDA (usually only done by post, timing being a real problem)? For the (oh so kind, patient, and helpful) veterinary border services folks I talked to at the airport here, a USDA-accredited vet *should* be an official vet — in France, such an agrément does mean one has delegated authority from the State. But no one was willing to put that in black and white on an email so I’d have proof. No one could explain why the US imposed a two-step process they’d not heard of. I’m sorry, I’m a TRANSLATOR! This could be subject to interpretation. I need to be sure. I can’t take a the risk a rescue on one end might put the animal in peril at the other. I was put in touch with an expert in another country in Europe who gave me the definitive explanation needed. A USDA-accredited vet is an official vet… but only when exporting a pet from one US state to another US state. Who has ever heard one needed to have a health certificate stamped by a USDA-accredited vet before moving with a pet from one state to another??? I’d not, and neither have any of my friends…. But if one is taking the pet out of country, the USDA embossed stamp is indeed also required.(Damn). He did say that I had a better than 50/50 chance of being able to bring the cat into the country without this second stamp because many customs agents don’t do a thorough job or don’t know what to look for. If I got caught, however, the cat would be held at the airport until I could get the paperwork endorsed by the USDA or it would be shipped back by cargo (NO!!!) to the US. Not a risk I am willing to take. Especially when he mentionned that a golden retriever that had arrived from California the previous day was waiting, caged, at the airport, until his owners got the USDA endorsement back by international express delivery. 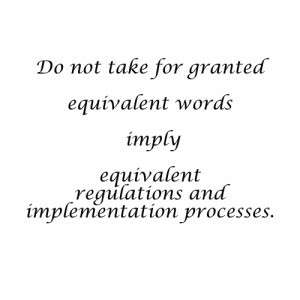 Equivalent words and expressions don’t automatically imply that rules and regulations are applied / carried out in identical ways. It can become crucial, as in the case here, to learn all you can about the processes behind the words lest they paint a very different picture. A complacent acceptance of the appearance of equivalence can hold bad surprises. P.S. : If anyone ever needs info on bringing a pet from the US to Europe (the reverse is much easier), I’m your go-to person!